Building winning teams is our Goal. Ongoing Talent Search We are continually using multiple recruiting resources in order to attract the most qualified candidates available. 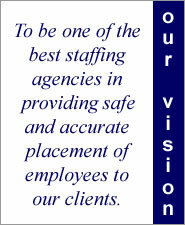 Screening We strive to provide our clients with skilled, reliable candidates. Client profiles We learn what skills our clients use as well as their work environment and other intangibles, so that we can make successful matches and build a winning team. National Women’s Business Enterprise Certification.